Download "Care and use guide. Contents. a handy solution made easy. 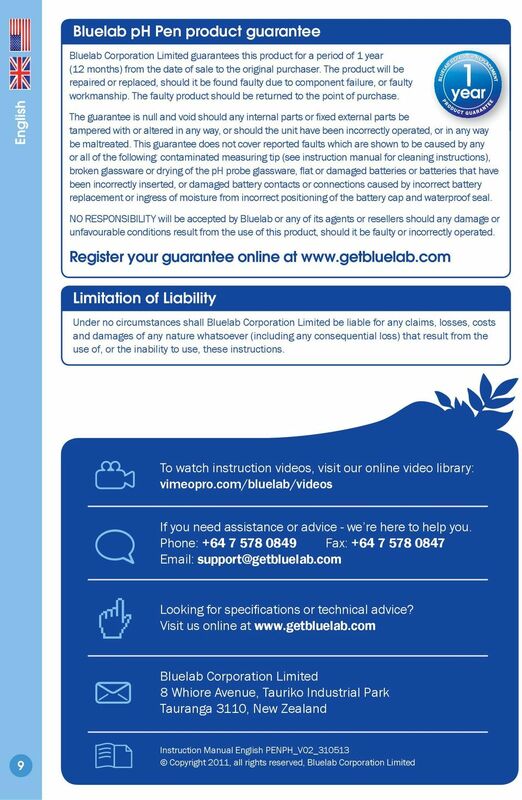 www.getbluelab.com. 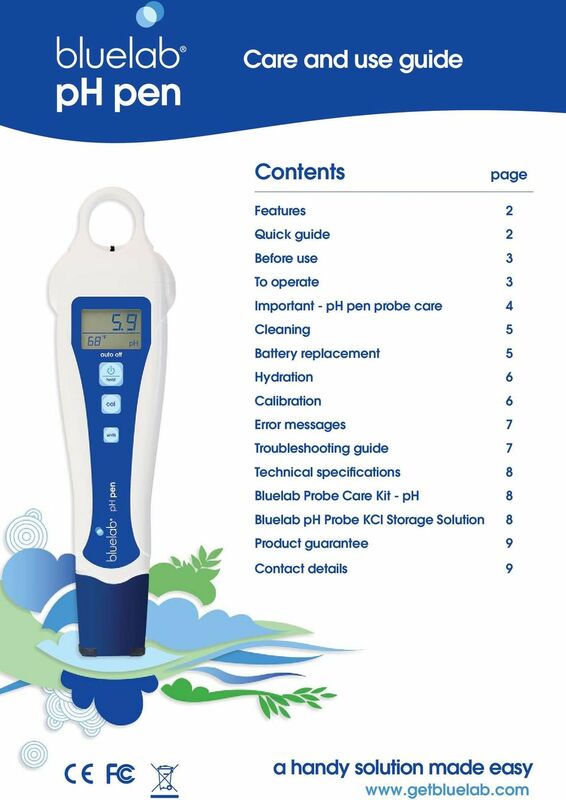 page"
3 .0 Before use begins Hydrate in KCl storage solution for 4 hours before you start using the ph pen. See section 6.0 Calibrate the pen before you start using the pen. See section To operate Turn pen on Press power button. To turn pen off Press and hold the power button until OFF is displayed. NOTE: The pen will automatically turn off after 4 minutes to conserve battery power. Measure ph Remove storage cap, place probe in solution and wait for reading to stabilize. Power button To hold reading If you want to hold the reading on the screen, short press the power button. To exit the hold function press the power button again. second alternating displays 4 To change temperature units Hold down the units button for seconds until the temperature units start fl ashing. Short press the units button again to cycle between F and C. To exit this mode don t press anything for seconds. NOTE: You can change units while in hold mode by holding down the units button. 5 Rinse and replace storage cap To ensure accurate ph readings always rinse the probe in clean fresh water before replacing the cap. Add -5 drops of KCl storage solution in to the wetting seal of the cap each week. The cap is tight to ensure a good seal and should click when on correctly. 4 .0 IMPORTANT - ph pen probe care ph probes do not last forever. They age through normal use and will eventually fail. The lifetime of a probe depends on the environment it is used in and the way it is treated. To ensure you receive a long life from your pen, please ensure you follow the guide below. Storing the ph pen When storing the ph pen, the probe tip must be kept moist. Add -5 drops of KCl storage solution into the wetting seal inside the storage cap once a week. Never use RO, Distilled or De-ionized water. Place the seal and cap over the probe tip. Long term storage For long term storage, remove the cap and place the pen upright in a plastic container. Cover the probe tip with KCl storage solution to ensure constant hydration. Check the container regularly and top up the KCl storage solution as needed. If the probe has been accidentally allowed to dry out: The probe must be hydrated for 4 hours in KCl storage solution (never use RO, Distilled or Deionised water). Following this; carry out a calibration to check if the probe has already suffered permanent damage. Temperature probe Wick Glass bulb Storage cap Wetting seal 4 DO NOT let the probe tip dry. IF IT DRIES IT DIES! DO NOT knock the pen; this will break its external glass bulb or internal glass tube. DO NOT touch the glass bulb with your fi ngers as this will contaminate the glass. DO NOT plunge a cold probe into a hot liquid (or visa versa) - sudden temperature changes can crack the glass and permanently damage the pen. DO NOT soak or rinse the ph probe in RO (Reverse Osmosis), Distilled or De-ionized water. Pure water changes the chemistry in the reference, causing the probe to die. DO NOT immerse in oils, proteins or suspended solids that will leave a coating on the glass bulb. 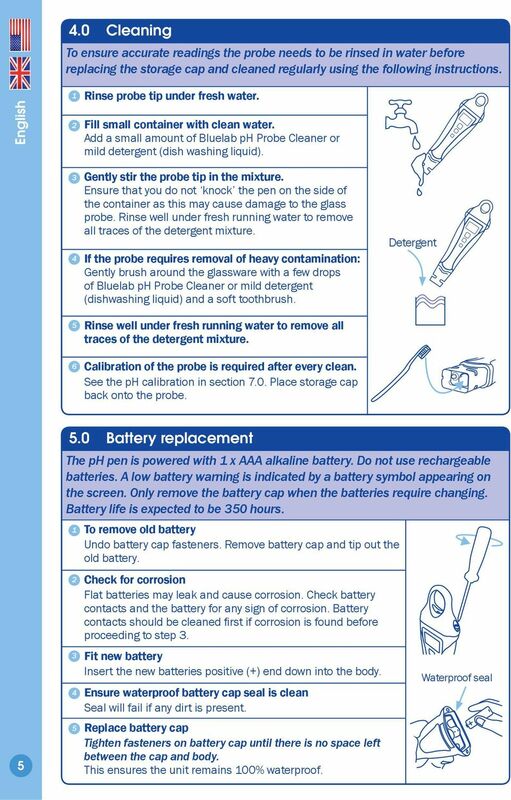 5 4.0 Cleaning To ensure accurate readings the probe needs to be rinsed in water before replacing the storage cap and cleaned regularly using the following instructions. Rinse probe tip under fresh water. Fill small container with clean water. Add a small amount of Bluelab ph Probe Cleaner or mild detergent (dish washing liquid). 4 Gently stir the probe tip in the mixture. 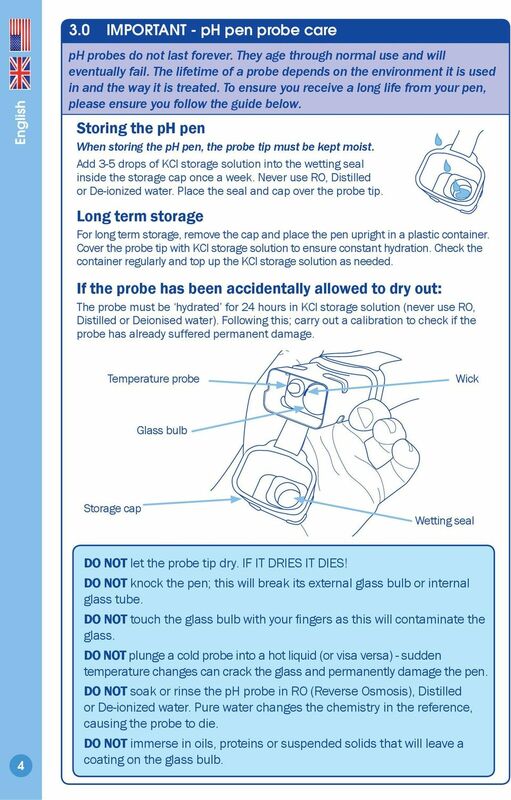 Ensure that you do not knock the pen on the side of the container as this may cause damage to the glass probe. Rinse well under fresh running water to remove all traces of the detergent mixture. 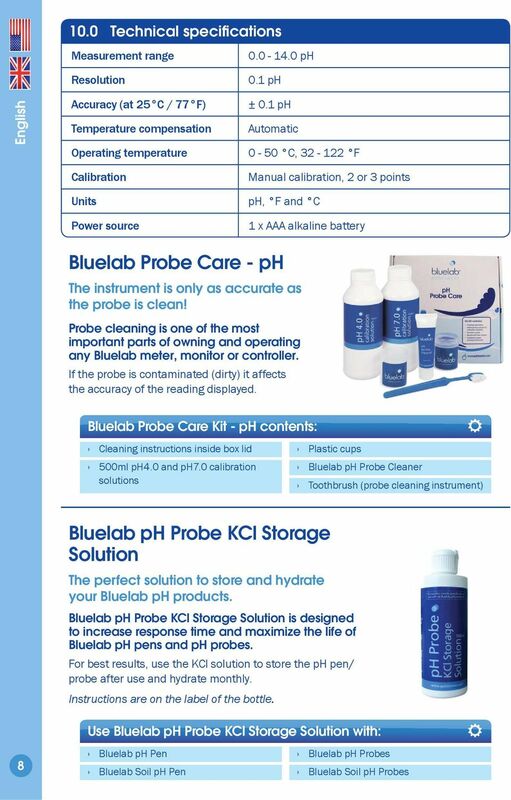 If the probe requires removal of heavy contamination: Gently brush around the glassware with a few drops of Bluelab ph Probe Cleaner or mild detergent (dishwashing liquid) and a soft toothbrush. Detergent 5 6 Rinse well under fresh running water to remove all traces of the detergent mixture. Calibration of the probe is required after every clean. 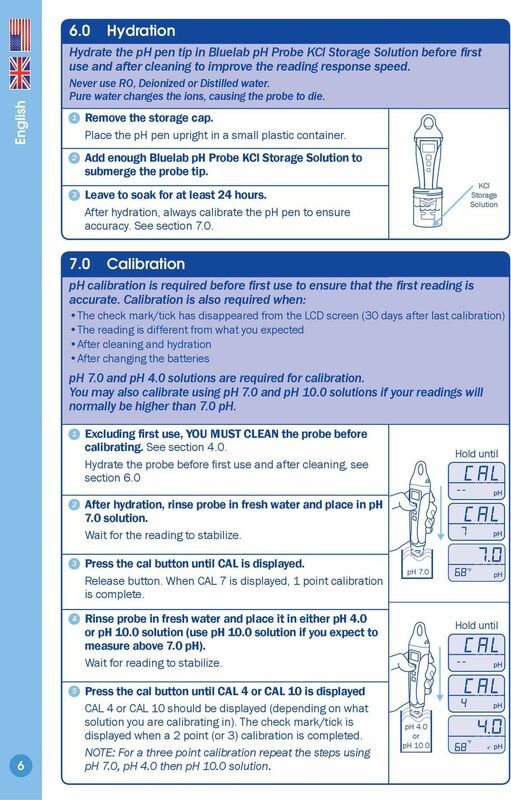 See the ph calibration in section 7.0. Place storage cap back onto the probe Battery replacement The ph pen is powered with x AAA alkaline battery. Do not use rechargeable batteries. A low battery warning is indicated by a battery symbol appearing on the screen. Only remove the battery cap when the batteries require changing. Battery life is expected to be 50 hours. To remove old battery Undo battery cap fasteners. Remove battery cap and tip out the old battery. Check for corrosion Flat batteries may leak and cause corrosion. Check battery contacts and the battery for any sign of corrosion. Battery contacts should be cleaned fi rst if corrosion is found before proceeding to step. Fit new battery Insert the new batteries positive (+) end down into the body. Waterproof seal 4 Ensure waterproof battery cap seal is clean Seal will fail if any dirt is present. 5 Replace battery cap Tighten fasteners on battery cap until there is no space left between the cap and body. This ensures the unit remains 00% waterproof. 7 8.0 Error messages The following error messages appear for the following reasons. 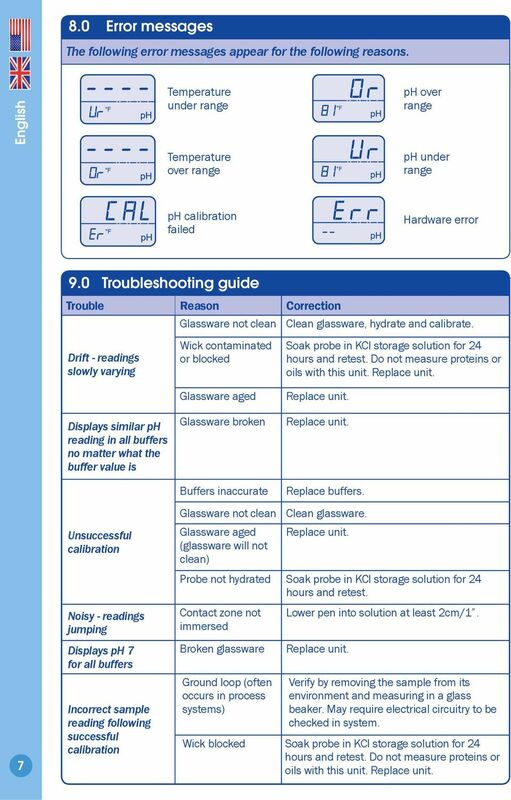 Temperature under range ph over range Temperature over range ph under range ph calibration failed Hardware error 9.0 Troubleshooting guide Trouble Reason Correction Glassware not clean Clean glassware, hydrate and calibrate. Drift - readings slowly varying Displays similar ph reading in all buffers no matter what the buffer value is Wick contaminated or blocked Glassware aged Glassware broken Buffers inaccurate Soak probe in KCl storage solution for 4 hours and retest. Do not measure proteins or oils with this unit. Replace unit. Replace unit. Replace unit. Replace buffers. 7 Unsuccessful calibration Noisy - readings jumping Displays ph 7 for all buffers Incorrect sample reading following successful calibration Glassware not clean Glassware aged (glassware will not clean) Clean glassware. Replace unit. Probe not hydrated Soak probe in KCl storage solution for 4 hours and retest. Contact zone not immersed Broken glassware Ground loop (often occurs in process systems) Lower pen into solution at least cm/. Replace unit. Verify by removing the sample from its environment and measuring in a glass beaker. May require electrical circuitry to be checked in system. Wick blocked Soak probe in KCl storage solution for 4 hours and retest. Do not measure proteins or oils with this unit. Replace unit. Care and use guide. Contents. a handy solution made easy. page. 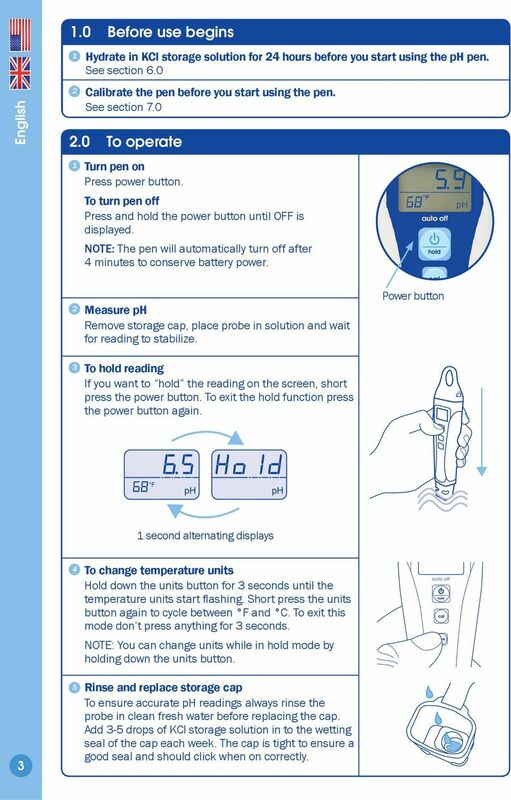 Bluelab Combo Meter TM Instruction Manual. combo metertm. el-720 Carbon Dioxide Gas Leak Detector User s Guide Congratulations on the purchase of the AccuTools el-720 Carbon Dioxide Gas Leak Detector, the most technologically advanced instrument of its kind. 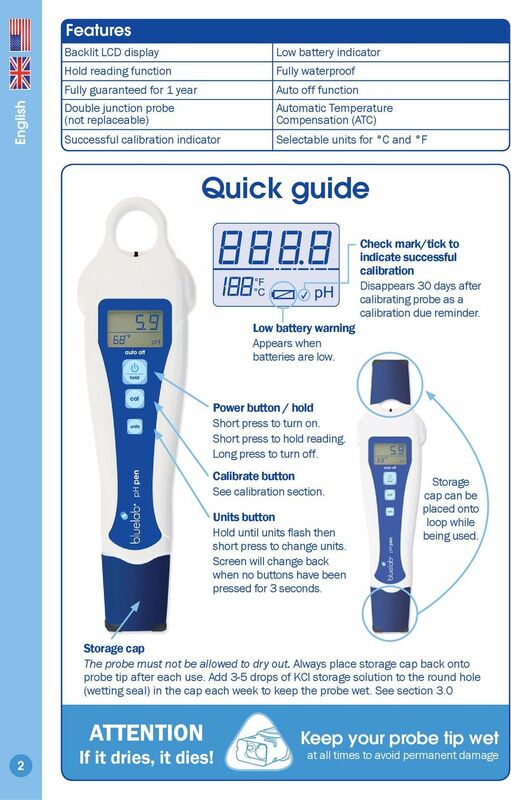 MODEL IQ240 ph Meter Getting Started TWO-POINT CALIBRATION--QUICK REFERENCE GUIDE 1. 2. 3. 4. 1 MODEL IQ240 ph Meter Getting Started TWO-POINT CALIBRATION--QUICK REFERENCE GUIDE 1. 2. 3. 4. Connect probe to meter. Put probe in first calibrating buffer. Press ON/OFF to turn on meter. 5. 6. 7. 8. TESTING TIPS If you want to go to a particular section, click on the index below or use the bookmarks. PT1 ULTRAPEN. myronl.com. Conductivity/TDS/Salinity & Temperature Pen S ACCURATE S RELIABLE. S SIMPLE Professional Water Analysis. myronl.com/pt1. imagine explore learn Drop Counter Sensor Product Number: ENDRP-AD100 Overview The Drop Counter sensor is an optical sensor that accurately records the number of drops of titrant added during a titration. Refer to page 6 to page 22 for detailed instructions. LASER DIAGRAM TABLE OF CONTENTS. SKY Technologies Inc. www.skytechlasers.com. Laser Diagram. Technical Specifications. Laser Operation. Refer to page 6 to page 19 for detailed instructions. Sunbeam EasyMeasure. Electronic food scales. Instruction Booklet FS7600. Please read these instructions carefully and retain for future reference. PT3 ULTRAPEN. myronl.com. ORP & Temperature Pen S ACCURATE S RELIABLE. S SIMPLE Professional Water Analysis. myronl.com/pt3. CP-40, CP-60, CP-100 Coffee Percolators This manual contains important information regarding your Admiral Craft unit. Please read this manual thoroughly prior to equipment set-up, operation and maintenance.